The instruments the Beatles played (particularly the guitars) are another point of fascination for rock musical artists who've ever been inspired by the Beatles (which is almost every musician who lived after them). Let's go through the guitar line-up for each of them during their career with the Beatles. 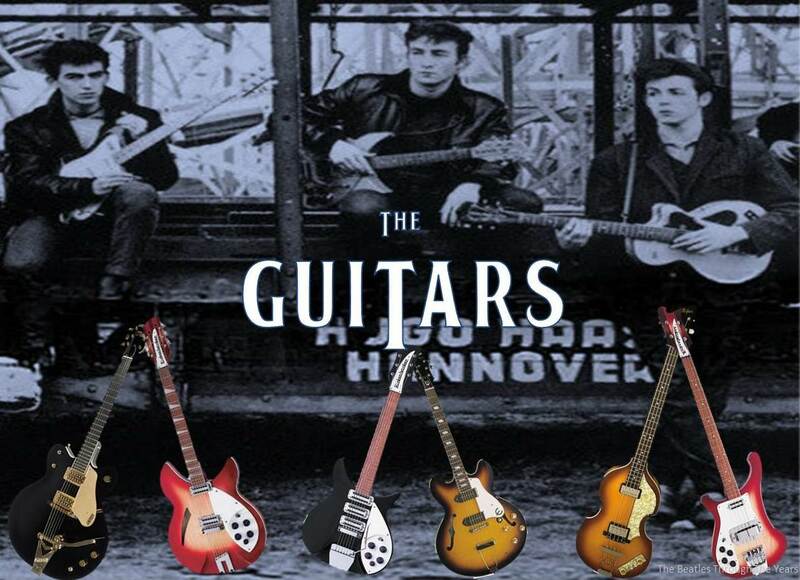 Afterall, the music that they created, and that changed the world, came from these guitars. In 1960 when The Beatles were playing in Hamburg, Germany John decided he wanted a really good guitar and chose the Rickenbacker 325. 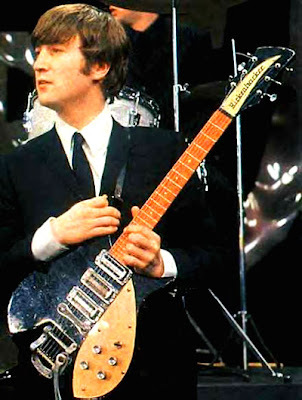 Lennon used this Rickenbacker from 1960 to '64 (It's last TV appearance occurring on the Beatles US TV Debut on The Ed Sullivan Show) Over the course of those four years John changed the knobs and had it painted (perhaps he'd done it himself?) black. This is thought to be The Beatles manager Brian Epstein's idea to give the band a better look. This is the Guitar most associated with Lennon's Early Beatles Rhythm sound. 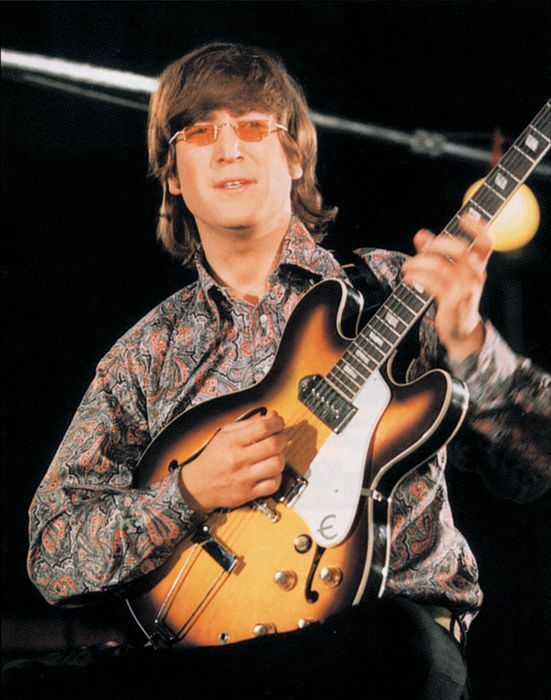 John later stripped the finish off this guitar and used it during his Bed-In for Peace in 1969. How it would have looked had John used it during the 'Our World' broadcast. Now, George's guitar (which was actually Lennon's 'Jumbo'.....still with me here?) 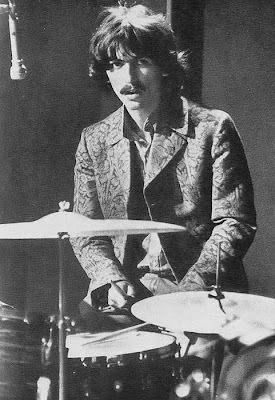 is believed by many to be "lost" as he gave it away sometime after the Sgt Pepper sessions. But the new smartphone app that Dhani Harrison put together showcasing George's guitar collection that is still part of the Harrison estate seems to showcase a certain 1962 Gibson J160e.......Maybe Harrison (who was an avid sharer of his instruments) didn't give this guitar away after all? L'Angelo Mysterioso, indeed! The J-160e as it appears in the App. 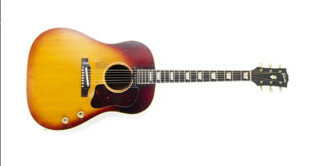 How the guitar appeared when Lennon first acquired it in 1965. Although he never used it live while with the Beatles, Paul put the Casino to work a lot in the Studio. John & George rehearse for The Beatles one and only live appearance on British TV's 'Top of the Pops' with their Casino's. Loving John's outfit here too! 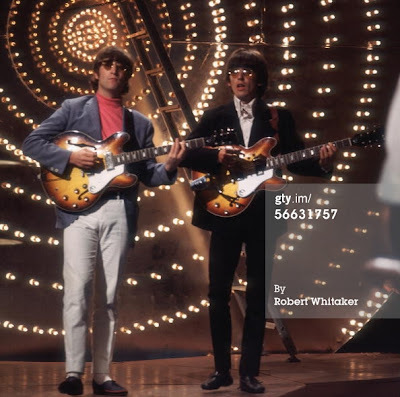 They were also the main guitars for their final world tour in 1966. 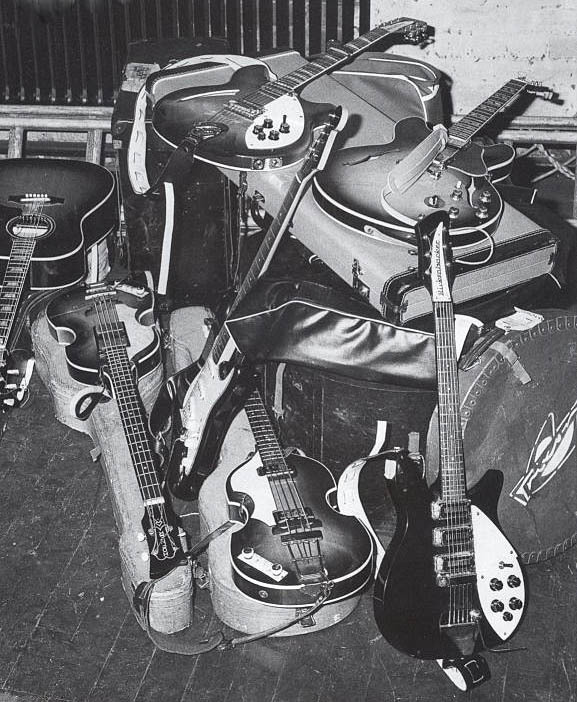 The Epiphone Casino actually came into The Beatles' stable through their bass player Paul acquiring one in late 1964 (on the advice of John Mayall) so he could keep his hand in on the guitar work in the studio. 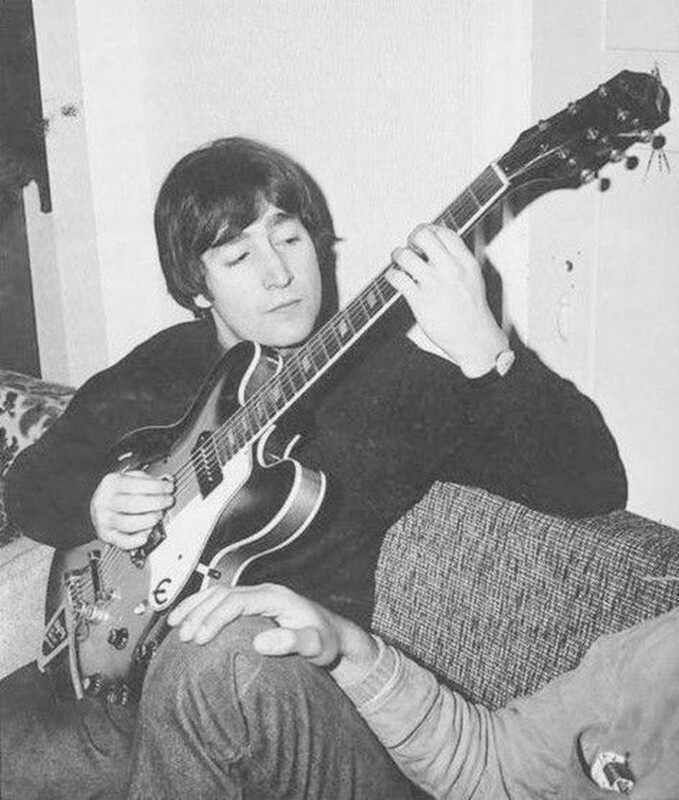 Before Paul had it restrung left handed John played it and obviously liked it as a couple of months later he and George got one each (John's was the only one not to have a Bigsby tremelo arm. Presumably because he didn't use or like them) and used them on their last ever tour in 1966. 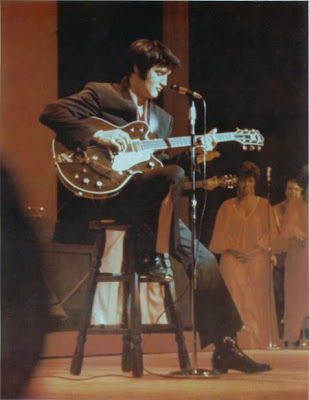 Paul used his for his lead guitar work with the Beatles and continues to use his on tour to this day stating that if he could only have one Electric guitar it would be the Casino. 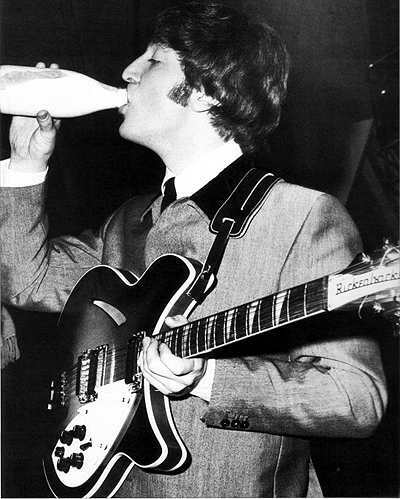 John and George had theirs sanded down and Lennon used his until 1971 when he complained during sessions for his Imagine album that it was getting harder to hold down a chord on it. 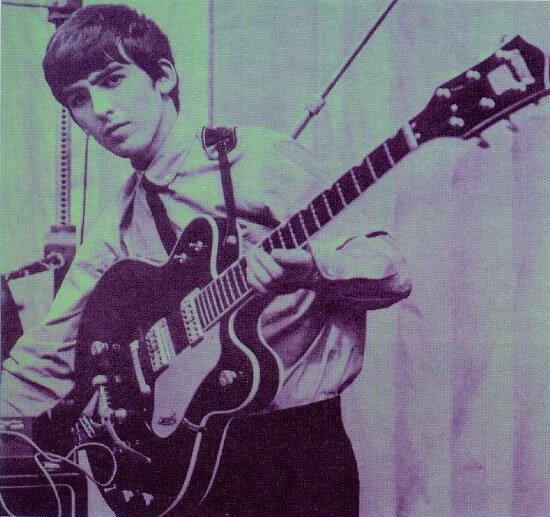 George seemed to have stopped using his in 1967 Although he may have used it in his solo career but since he enjoyed using Fender guitars for their easy slide guitar capabilities. Paul gets his new Casino and George thinks "I have to get me one of these!" ....and John nabs it for a quick strum! Paul still uses his Casino today for recording and touring. 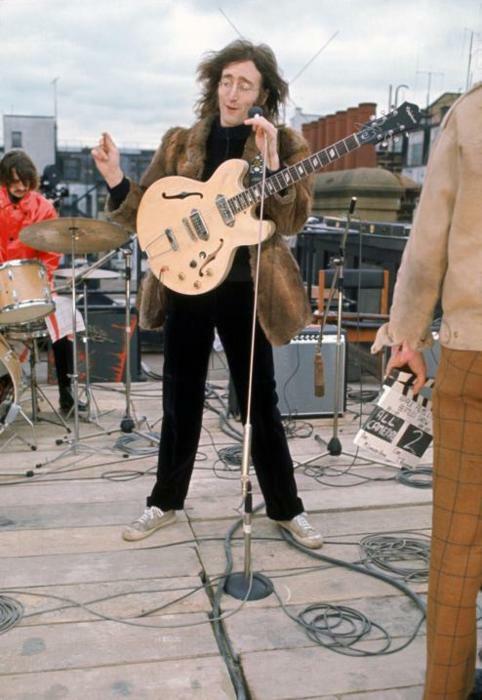 Lennon with his sanded down Casino during their 1969 Rooftop Gig. The "Revolution" Casino is offered by Epiphone for Lennon purists out there. 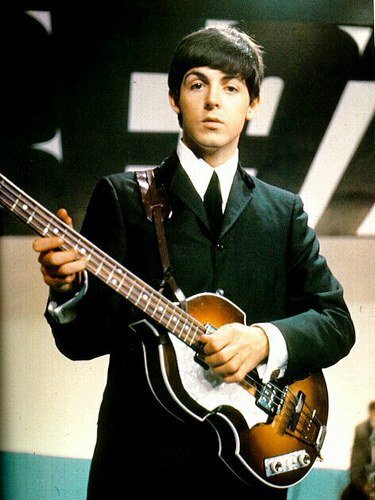 The Cavern Bass was Paul's first Hofner until they gave him a newer model. 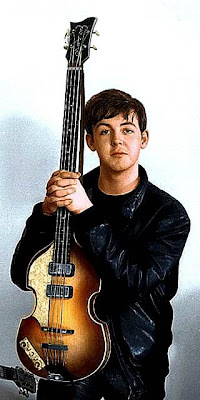 Macca with his original Hofner Bass in 1961. This was stolen during the 'Get Back' sessions in 1969 and has never been recovered. Whoever has this Bass. Give it back. In 1961 Stuart Sutcliffe was leaving the Beatles. He couldn't really play music and wasn't particularly interested in learning. 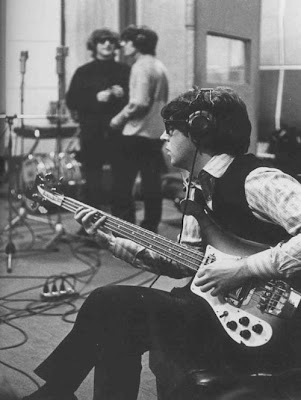 Since Stuart had been the band's bass player, Paul was tasked by John and George with the responsibility of taking it up and being the Beatles' official bass player. So, with a pocket full of Deutsch Marks and dreams of being the next Paul McCartney (Wait a moment! ), he went to a music shop in Hamburg where he saw a bass hanging up. Though it wasn't what other rock musical artists were playing, it was just what McCartney wanted since he was left-handed. Right-handed guitars and basses were awkward to play due to the cut-away and knobs being on the top instead of the bottom. Macca plonked down the dosh (about 30 quid back then) and walked out of that music house holding the bass that he would make history with. Macca used the Bass until late 1963 when Hofner gave him their updated model (see below) and relegated it to Back up duty before having it re-finished and new pick-ups installed. 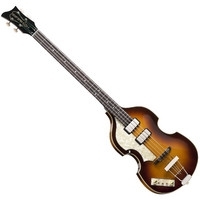 It is last seen during the Let It Be film and it was during this time it was stolen. 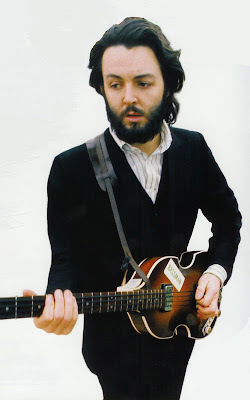 Paul rocking his original Hofner during the Revolution video in 1968. 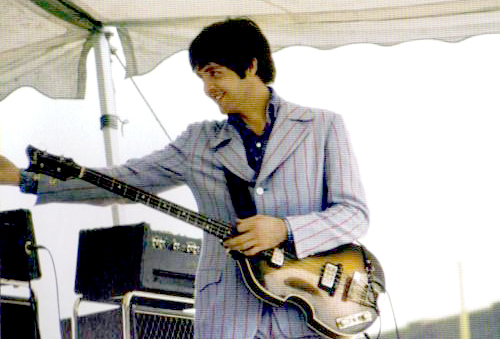 Paul with his new Bass, perhaps it's first outing? 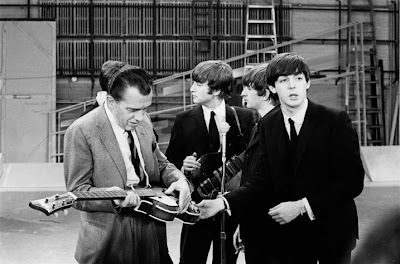 Paul shows Ed Sullivan the Hofner before the Beatles debut appearance on his show. 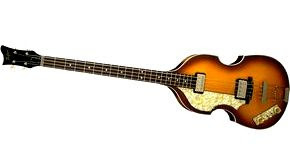 Just after The Beatles had recorded their second album With The Beatles in 1963, Hofner gave Paul their new model of bass, possibly the most famous of all the guitars used by the Beatles. Macca started using it straight away, relegating his first one to back-up duty. He stopped using it in the studio when Rickenbacker gave him their 4001 model in 1965, but continued to use it on tour until they stopped touring in 1966. 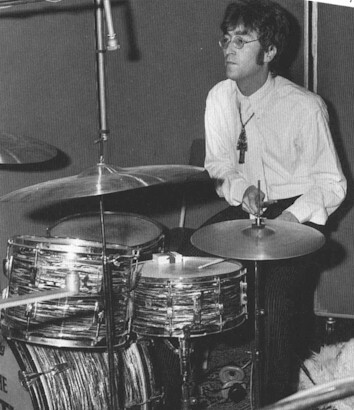 Then, it was left alone for a couple of years, until he started using it again during the Let It Be sessions. After the Beatles split, he stopped using it during Wings and his 80's solo output, until Elvis Costello made him get it out for Flowers In The Dirt in 1989. Since then, Paul has used his Hofner on tour and in the studio to the point that is has become something you expect to see when you see Paul McCartney perform. 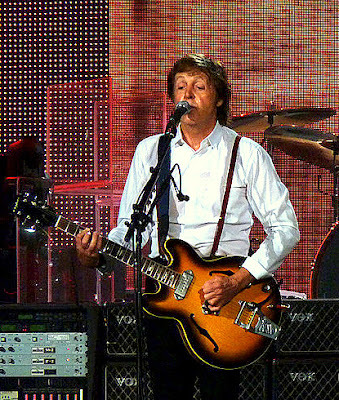 Paul with the Hofner on it's last tour for 23 years. The 1969 Rooftop Gig would be the last time the Hofner would be played live for 20 years. 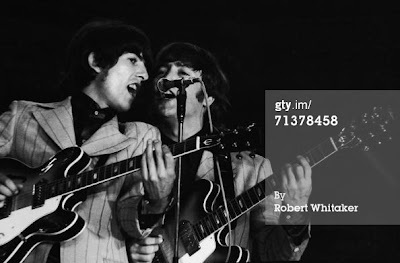 That gig was also the last time The Beatles played together live. 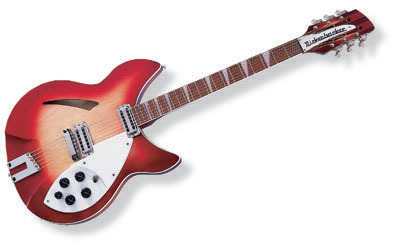 It wasn't until The Beatles were touring the USA in the summer of 1965 that Hall had built a left-handed Model of the Rickenbacker 4001. 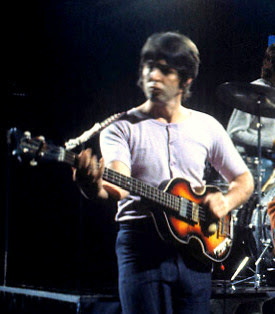 And after rock musical artists like The Byrds had started using Rickenbacker guitars because of The Beatles, Hall decided to give Paul this bass completely free of charge in Burt Lancaster's house. (Poor old Burt didn't get one though!) So, Paul set out to make his new bass famous and used it on studio albums, as well as on tour with Wings in the 70's, before retiring it in the mid 80's in favour of his Hofner. Will Macca ever play the Rickenbacker on tour again? My guess is probably not, since it's a heavy piece of equipment and Paul's getting older now. 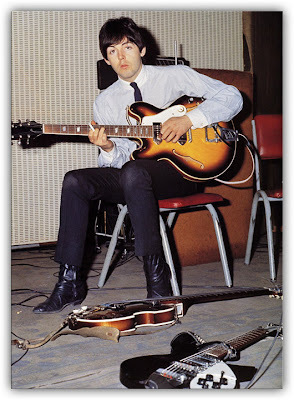 Besides, the Hofner serves all his needs stage wise. But still, it would be nice to see it on just a couple of songs; how about it, Macca? Even the King of Rock & Roll liked the Country Gent. Jangle Pop was born when George started using this guitar in 1964. As stated above this was originally offered to John who passed on it. 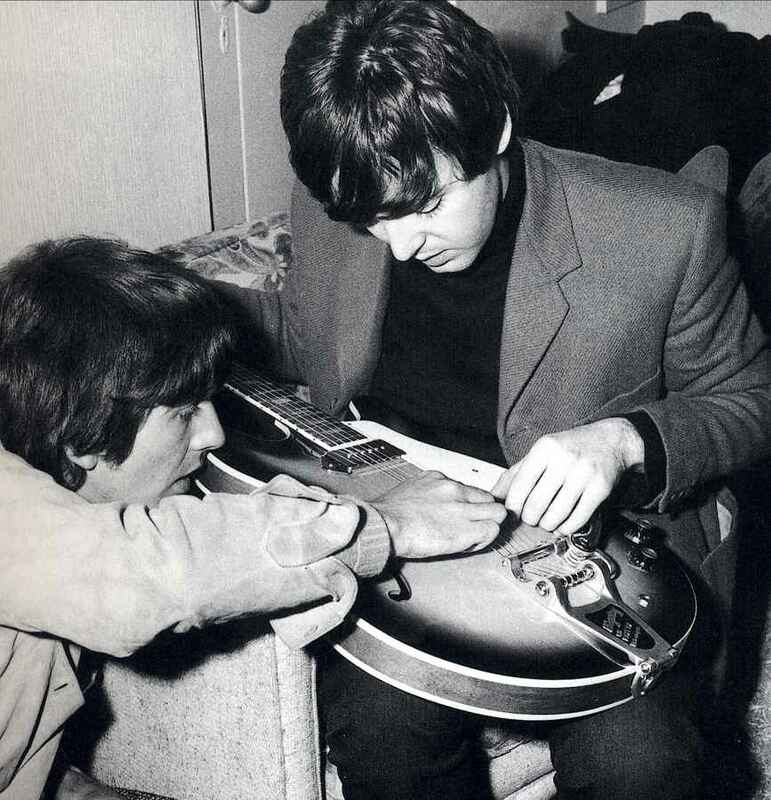 George started using this guitar immediately after returning from The Beatles first US visit, and it is seen in their first feature film A Hard Day's Night, and heard on the soundtrack album. Like John's Rickenbacker 325 and Paul's Hofner this guitar is one of the most famous instruments the Beatles played. 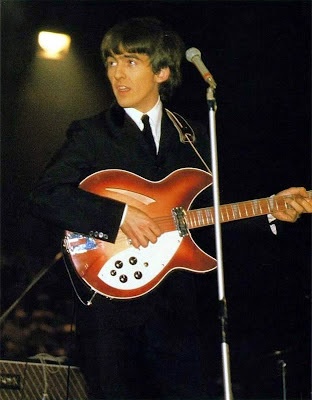 George stopped using it when he got another 360 from a Minneapolis Radion Station in 1965 and used this on tour but both guitars were retired after The Beatles touring life came to an end in 1966. In 1987 George dusted it off and used it on his album Cloud Nine and it is still part of his estate today and featured prominently (but was never played) during his memorial Concert For George in 2002. The second 360 was stolen in 1969 along with Paul's first Hofner. Anyone who thinks they may have this guitar, please don't put it up for auction. Instead, contact Olivia or Dhani Harrison and return this piece of history to where it belongs: The George Harrison Estate. It never hurts to do the right thing. 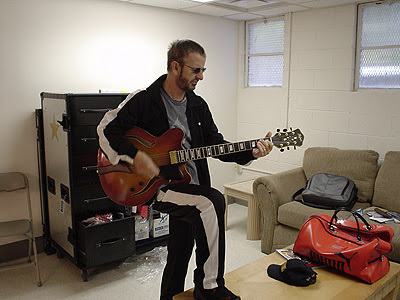 Ringo also played guitar. But you didn't hear it from me. Right?! 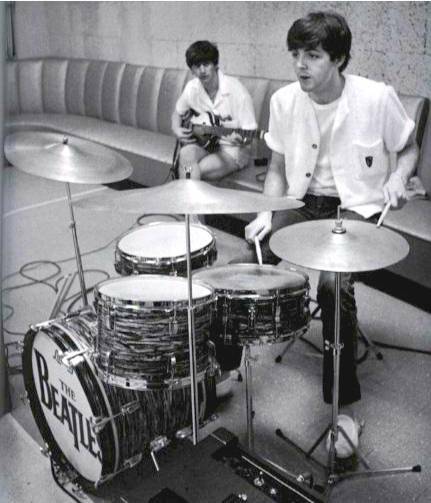 John, Paul & George liked to have a go on the drums too. They were what Ringo liked to call "closet drummers"
I realise that I haven't covered all of the guitars used by the Beatles while on tour, or in the studio, so if you want to find a comprehensive list of the Beatles guitars, I suggest you check out John Crowley's excellent Fab Guitars of the Beatles page. It details every guitar the Beatles played in the studio and on stage. If you liked this article, you might have a mosey on over to The Top 5 Guitars You Need to get The Beatles Sound. 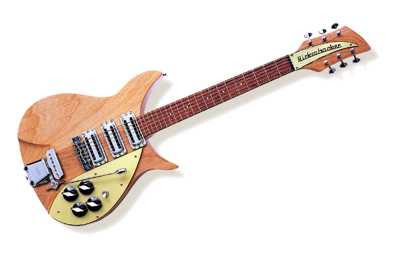 Now that I'm older, I can afford a Rickenbacker. As a kid, I grew up listening to the Beatles and prompted me to learn how to play guitar (like so many other kids in the '60's). 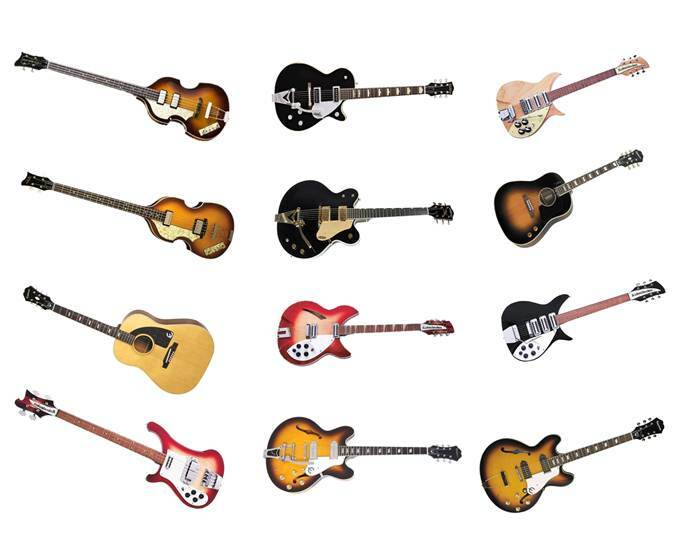 The question is: which Rickenbacker do I get? So many tones, so many styles. Indeed! I think it all depends on what Rickenbacker you're comfortable with, is it a 325, like Lennon? or a 360 like George? Both are wonderful! I envy your choice! 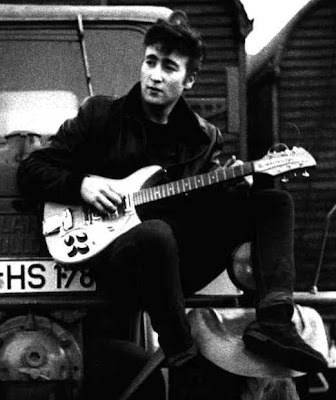 I bought 1 Hamburg C Series 1958 in maple-glo like John's first original one in 2008. It's not available anymore though. Then I bought a black with white pick guard 350V 1963 full scale one too. They're pretty great and play like gold! I'm responding a years later and I hope this answer helps. I have both guitars. But my 360 is a 6-string, George had a 12-string. The 360 is more of a lead guitar, while the 325, which is 3/4 size, is more of a rhythm guitar with heavier strings. I use a medium pick on the 360 and an acoustic, but I have to use a heavy pick with the 325. My lefty Hofner was stolen from me at a gig in the Isle of White. It's probably in the hands of some righty. Sorry to hear that someone stole your guitar form you. Hope someday that you'll get it back. I still have both Rickenbacker's. Knock on wood! 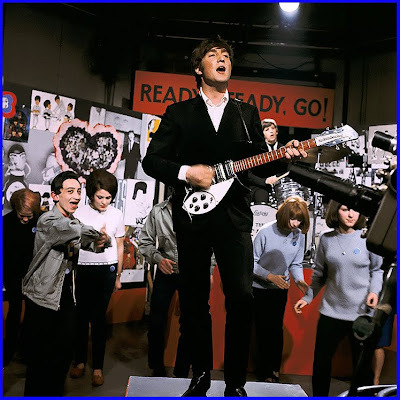 The george started using this guitar immediately after returning from the beatles first US visit, and it is seen in their first feature film a hard day's night, and heard on the soundtrack album. Just like on this. It was originally offered to John who offered it. George started using this guitar soon after returning from. Then in 2013, I bought the black model Rickenbacker 350 V 1963 full scale solid body one for $2200.00. Again factory brand new from Musican's friend. I keep a tight grip on both of them. Never, do I let them out of my sight! And both guitars are still mint! That Gretsch Country Gent is my favorite out of all of these, what a beauty! Amazing. Thanks for sharing wonderful information. Now you can buy electric guitar online at Musicshake. Thanks for sharing this post with us. As far as I can see, Fender is not included in the picture above, although a Rickenbacker 425 is. This one belonged to George, who used it in the early 60's and later again in his solo career, since this guitar was easy to slide, and made beautiful sound, as it can be heard in "This Is Love" For Instance. There is a dark-bodied Strat (with matching coloured headstock) right in the middle of the picture. Took me a little while to see it! There is one guitar you might be missing. George had a Fender Stratocaster that he named "Rocky". In 1966 or 1967 he painted it (using some of Pattie Boyd's nail polish) to make it appear more psychedelic. This guitar is visible in the "I Am the Walrus" music video and on the Magical Mystery Tour film. There's one guitar you are missing. George had a Fender Stratocaster that he named "Rocky". In 1966 or 1967 he painted it (using some of Pattie Boyd's nail polish) to make it look more psychedelic. 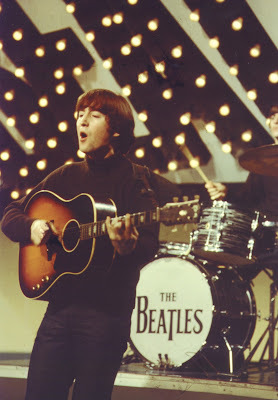 This guitar can be seen in the "I Am the Walrus" music video and on the Magical Mystery Tour movie. Astonishing. Bless you designed for writing splendid tips. Nowadays order guitar web based within Music shake. Bless you designed for writing it blog post around. Thank you sooo much for posting this. I have been looking for a way to organize my girls books. This is PERFECT! Not to mention really inexpensive. 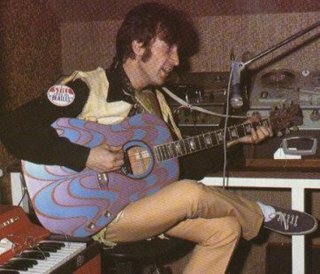 Lennon never had a Ric 360-12 and this Guitar was not offered for him. It's George's Guitar, on a pic is John backstage during A Hard day's Night filming. This is original Lennon's 12-string Rickenbacker 325-12. Hi Bob! Thanks for commenting! 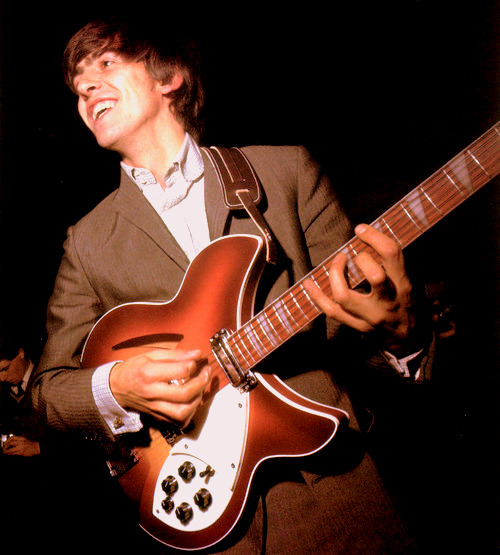 According to an article I read from John Hall, his dad took the Rickenbacker 360 over to the Plaza hotel during their first US visit and offered it to John, since he was the main Rickenbacker player in the band. John didn't like it and told Hall to go and see George and see if he wanted it. George jumped at the chance and asked Hall to ship it back to England. Hall promised Lennon an updated model of his 325, which was then delivered to the Deauville Hotel in Miami just in time for their appearance on the Ed Sullivan show down there.